It’s the return of Vinyl Wednesday. Let’s not even talk about the last time we had one, ok? Thanks for your understanding. I am not sure if I have mentioned before but I have quite a few interesting little collections. Little collections that turned into huge ones and now I have no place to keep them. Hoarder problems. My favorite collection is my children’s records. These started with some hand me down records from my older siblings that I used to rock/wreck on my brown Fischer Price record player. Some of these were second hand to them so by the time it got to me they were pretty thrashed. The lines and memories have blurred as to which ones were my brother’s and sister’s from ones that were given to me to ones I have bought, sometimes in triplicate. I just can’t leave a kiddie record behind if the price is right. The Disneyland Records are the jewels of my collection. My top favorites are movie soundtracks and ride soundtracks. I still have a few missing from my collection. Feel free to contact me to donate your old records to my quest. I feel this film falls under the radar and out of the popular eye because there are no damn princesses in it. That is ludicrous! 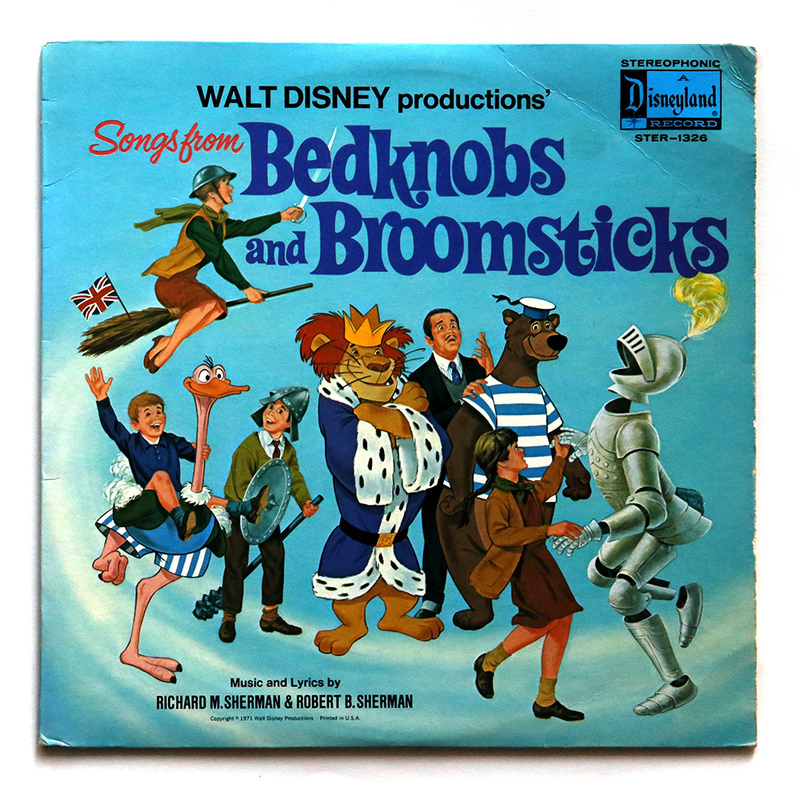 This is the BEST KIND of story for kids to get into – adventure, make believe, underwater adventures, WITCHCRAFT which was a particular fascination of mine when I was a kid (what that is TOTALLY normal) SOMEONE GET ME A MAGIC BED-KNOB STAT! When the Disney Archive exhibit was at the Ronald Reagan Library I got to SEE the actual Bedknob. Dreams really do come true, sometimes. A bonus is that most the adventure in this movie takes place while they are all lounging on a bed, my dream come true. And look: I found the album for you, so convenient! 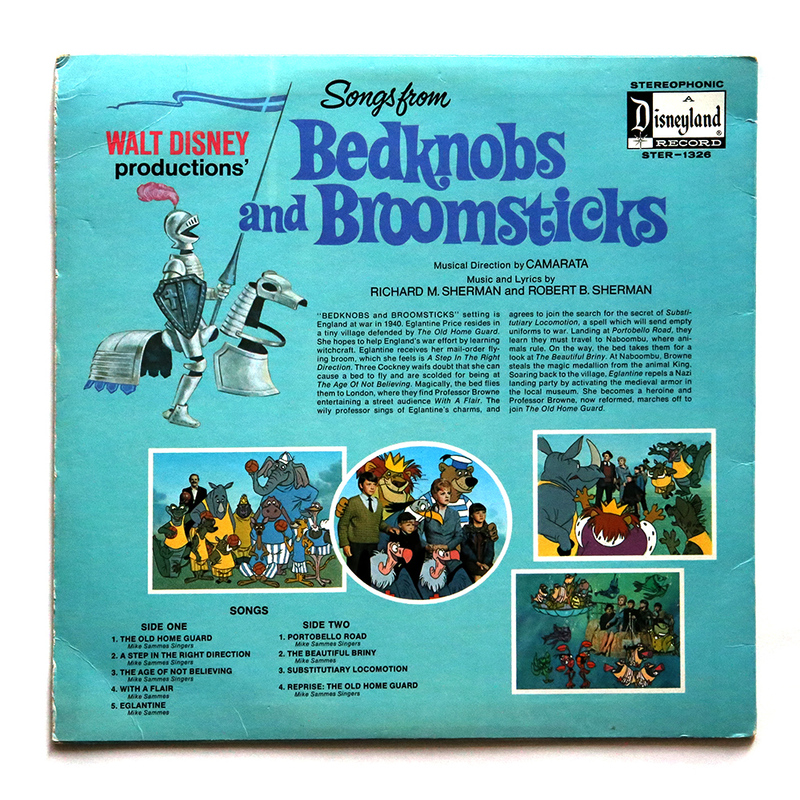 Plus it is written by the SHERMAN BROTHERS – whom can do no wrong in my eyes. Thanks for coming back to me for the reunion tour of Vinyl Wednesday – I will try not to make my absence a thing. Just to be safe you should subscribe! • What do you collect? • Favorite under the radar kids movie?